A nice St. Joe steelhead caught on a winter morning. Don’t let the cold keep you indoors. 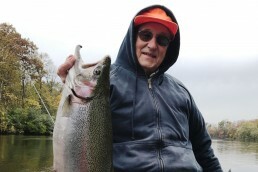 It’s time to catch St. Joe steelhead trout and brown trout in a heated and enclosed river boat on the St. Joseph River. 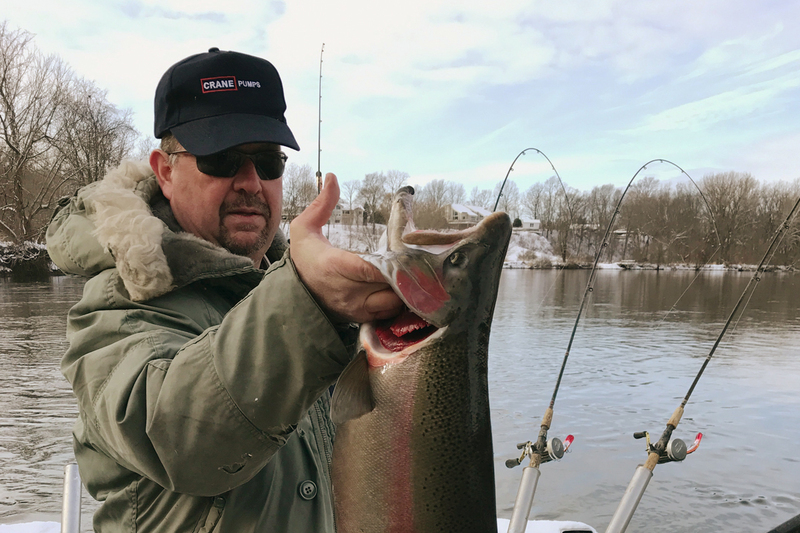 Much of the fishing slows down in January on the river, due to the extreme cold and abundance of ice. This can make for tough fishing. Many times, the Berrien Springs dam area is the only open water available. By February, most of the river is open from the Berrien Springs dam down to Lake Michigan. This is when I start guiding full time. There’s more river to fish, increasing the odds of having a good day. 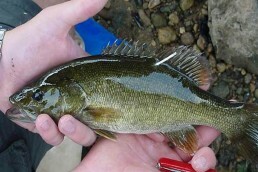 During the month of February, fish the deeper runs; 8- to 12-feet of water, on average. At this time, St. Joe steelhead usually hold around logjams and wherever else there might be a current break. Slower current areas are usually the best. Always position your boat well above the logjam and work spawn and lures back to it. The two most popular methods for St. Joe steelhead are anchoring and working spawn and lures thru the run or slipping with crankbaits, such as Flatfish, Hot ’N Tots or Wiggle Warts. Slipping is basically a controlled drift working plugs through a run very slowly. As March comes around, we start to see melt-off from the winter snows. This is good, due to the increase in current and warmer water temperature. These bring in the fresh run of steelhead and brown trout from Lake Michigan. During the month of March, you basically fish the same way as in February—unless the water becomes stained from the melted snow runoff. In that case, I fish more spawn than lures. If the river gets higher, as it usually does in March, the current gets faster in traditional spots. Don’t be afraid to try different spots where you can find slower current. Steelhead will be in spots where they don’t have to work against hard current. Good spots include along logjams, behind rocks and on the backside of gravel bars. This is also the time of year that the steelhead spawn. Spawning areas consist of fast moving current areas with rocky bottoms. They are usually in shallower water, about 3 to 6 feet deep. Spawning usually starts around mid-March. Combination spawn and lures are good at this time. My preferred lure colors are gold, orange and gold and chrome and red. For tackle, I use 8- to 9-foot light-action spinning and baitcast rods. Ten-pound-test line is on spawn rods and 20-pound goes on my plug rods. When fishing spawn, I use a three-way rig with a sliding dropper sinker. Set lines get about a 1-ounce sinker and back drifting rods get a lighter 1/2-ounce lead. I use a No. 2 egg hook for the spawn with an egg loop. My lure preference is Flatfish in the slower current areas and Hot ’N Tots in the faster current areas with straight gold or some combination of gold with black, orange or other colors. If you’re looking for a different sort of fishing challenge this year, check out our article on bowfishing during the winter. Several boat ramps are on the St. Joseph River between Berrien Springs and Lake Michigan. In Berrien Springs there is Shamrock Park near the Berrien Springs dam. The nice feature here is you can camp and use the fish-cleaning station. At mid-river, there is a DNR boat ramp off Jasper Dairy Road which is off U.S. 31. At the lower river, a boat ramp is near where U.S. 31 and I-94 cross at Exit 28. I’ve been guiding on the St. Joseph River for 33 years, now, and have met an array of great people. I hope you will come experience our beautiful river, whether you choose to experience it with me aboard Sea Hawk Charters or on your own. Just remember, you can be very comfortable during cold days in my 24-foot, heated and enclosed Carolina Skiff river boat. Don’t forget that Lake Michigan fishing kicks off in early April. We take our 36-foot Tiara out after kings, cohos, steelhead and lake trout.